• Afghanistan’s complexities undermined policy plans. 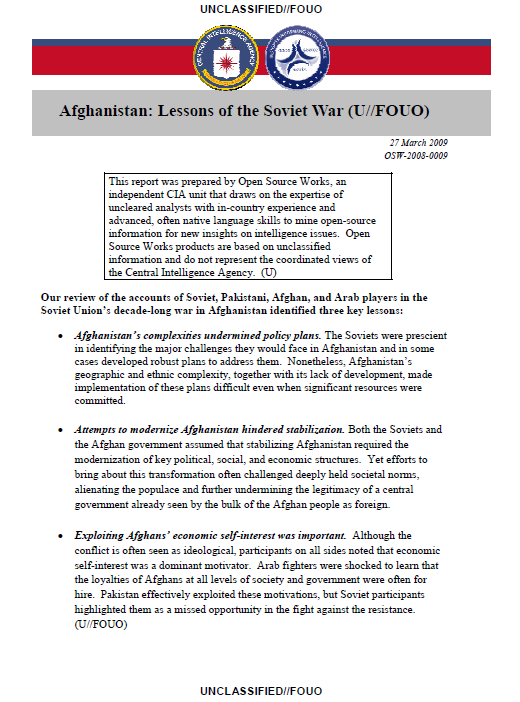 The Soviets were prescient in identifying the major challenges they would face in Afghanistan and in some cases developed robust plans to address them. Nonetheless, Afghanistan’s geographic and ethnic complexity, together with its lack of development, made implementation of these plans difficult even when significant resources were committed. government already seen by the bulk of the Afghan people as foreign. highlighted them as a missed opportunity in the fight against the resistance. substantial financial and human resources. human resources to the conflict. lacked legitimacy and that the Soviet presence would exacerbate this. set of forces, united only in “their common negative relation” to the regime. inform the tribal zone population about this measure. tribal zone to coordinate local administration and observe the general situation.